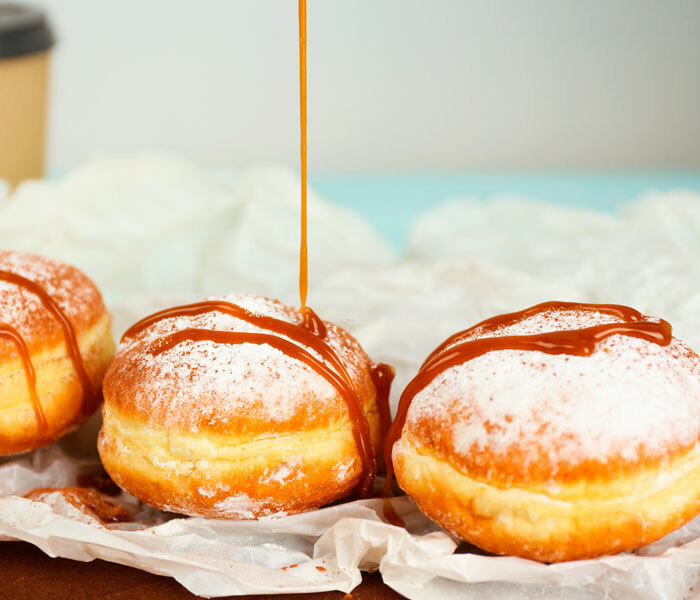 Here is a great doughnut recipe that can be made three ways: with a coffee icing, filled with coffee custard, or split with a coffee cream. Enjoy and let us know your favourite! 1. Sprinkle the yeast over the warm water, and let stand for 10 minutes, or until foamy. 2. Into a mixer put the yeast mixture, milk, sugar, salt, eggs, butter and the flour. Mix for a few minutes at a low speed using the dough hook. 3. Scrape down the bowl and knead with the dough hook for a further 5 minutes or until the dough is smooth and elastic. (If it’s a little wet add more flour so it leaves the sides of the bowl). Place the dough into a clean, greased bowl and cover. 4. Set in a warm place to rise until it doubles in size (about 40 minutes). 5. Turn the dough out onto a floured surface, and knock it back. Cut into 60g portions and roll into a ball then press down onto a greased tray. Let the doughnuts sit out to rise again until doubled in size, covering loosely with clingfilm. 6. Heat the oil in a deep-fryer or large heavy pan to 175°C. Slide the doughnuts into the hot oil using a wide spatula. Turn doughnuts over as they rise to the surface. Fry doughnuts on each side until golden brown. Remove from hot oil and drain on a wire rack. 7. Coffee Icing - Mix the Camp Coffee with the icing and add the water until you get a thick icing into which you can dip the doughnut. 8. 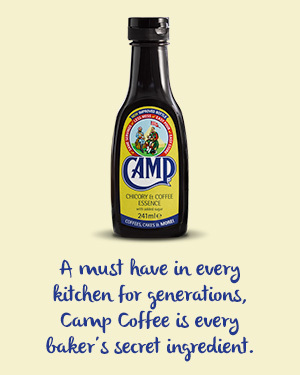 Coffee Cream - Add the Camp Coffee to the double cream and whip until it forms soft peaks. Split the doughnut in half and pipe in the cream. 9. Coffee Custard - Heat the milk on the stove, meanwhile mix the Camp Coffee, egg yolks, and corn flour together with the sugar to form a paste. Add the hot milk to the paste and whisk. Return the custard to the pan and heat gently until the custard thickens. Remove from the heat, cover with cling film and leave to cool. Once cooled, fill the doughnuts with the coffee custard.